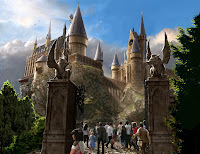 Universal Orlando Resort, together with Warner Bros. Consumer Products, today revealed first-ever details about the incredible scope of The Wizarding World of Harry Potter. Universal also announced that the highly anticipated land will open in spring 2010. 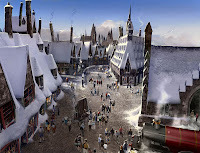 Inspired by J.K. Rowling’s compelling stories and characters – and faithful to the visual landscapes of the films – The Wizarding World of Harry Potter at Universal’s Islands of Adventure will provide visitors with a one-of-a-kind experience complete with multiple attractions, shops and a signature eating establishment. This completely immersive environment will transcend generations and bring the wonder and magic of the amazingly detailed Harry Potter books and films to life. 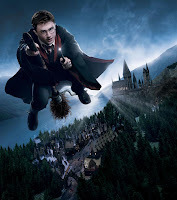 The expectations of Harry Potter fans are high and Universal Orlando Resort is collaborating closely with J.K. Rowling, Warner Bros. Consumer Products and the Warner Bros. Harry Potter brand team to ensure that The Wizarding World of Harry Potter will be an experience of a lifetime. The Harry Potter films’ production designer, Stuart Craig and art director, Alan Gilmore, in cooperation with a corps of artisans from Universal Creative are working daily to construct the most authentic Harry Potter experience possible. Guests will be able to sip Butterbeer in Three Broomsticks, buy Extendable Ears at Zonko’s and experience a state-of-the-art attraction that brings the stories of Harry Potter to life in a way never before imagined. Universal Orlando Resort is a theme park destination that places you and your family in the heart of pop culture’s most incredible and timeless stories – making you the superstar in a world-class adventure story and allowing you to discover your own inner hero. Guests experience two exciting theme parks – Universal Studios and Islands of Adventure as well as Universal CityWalk, a 30-acre restaurant, shopping and nighttime entertainment complex; and three magnificently themed on-site hotels – the Loews Portofino Bay Hotel, Hard Rock Hotel and the Loews Royal Pacific Resort. 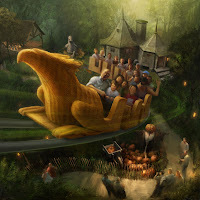 Flagship experiences featured in the theme parks include “The Simpsons Ride,” “Revenge of the Mummy – The Ride,” “The Incredible Hulk Coaster” and “The Amazing Adventures of Spider-Man.” More information is available at http://www.universalorlando.com/. Harry Potter continues to be a global phenomenon. The series of books by author J.K. Rowling has been translated into 67 languages with more than 400 million copies sold in over 200 territories around the world. The films, produced by Warner Bros. Pictures, have grossed more than $5.3 billion at the box office worldwide, making Harry Potter the largest-grossing film franchise in history.